In 1787 the territory where the University of Sydney now resides was a lush and thickly wooded forest of towering eucalypts. To the north the trees were home to bark-wrapped bones, teeth, and possums. Two Koori Roads snaked around the hill and met at a sit-down spot that is now Victoria Park. Several freshwater springs crept out of the grounds, one feeding a marsh. There were two scar trees, now lost. In 1792 the lands were seized by Francis Grose and over the next several years the tall forests were gradually whittled away until the area became quite barren, populated now by cows rather than possums. Well after the 1850s, when the land became home to the newly established University of Sydney, cows continued to wander through the grounds alongside the undergraduates. In 1927 Professor E. G. Waterhouse, despairing of the “wilderness” of the Quad and highly aware of the impending visit of the Duke of York, began a “beautification campaign”. Several areas were paved over, the wild grasses were replaced with carefully kept lawns, and a number of trees were planted, including camellias (Waterhouse’s favourite plant) and the now-famous Quad Jacaranda. Contrary to popular opinion this particular Quad Jacaranda did not survive for 88 years only to succumb to disease in the waning months of 2016. The first Quad Jacaranda was in fact remarkably short-lived. So was the tree that replaced it. So was the tree after that. And the several more that followed. According to Waterhouse it became a “stunt” for the students to uproot the successive jacarandas in the south-eastern corner of the Quad. The relationship between the jacarandas and the student population may perhaps be best described as a puckish kind of guerrilla warfare, that by all accounts seems to have been the bane of Waterhouse’s life and career. Honi Soit called the state of affairs a ‘civil war’. It lasted for decades. The tree was described variously by students as a ‘scraggy shrub’, a ‘desecration of our verdant lawns’, a ‘staunch sapling’, and an ‘arboreal excrescence’. 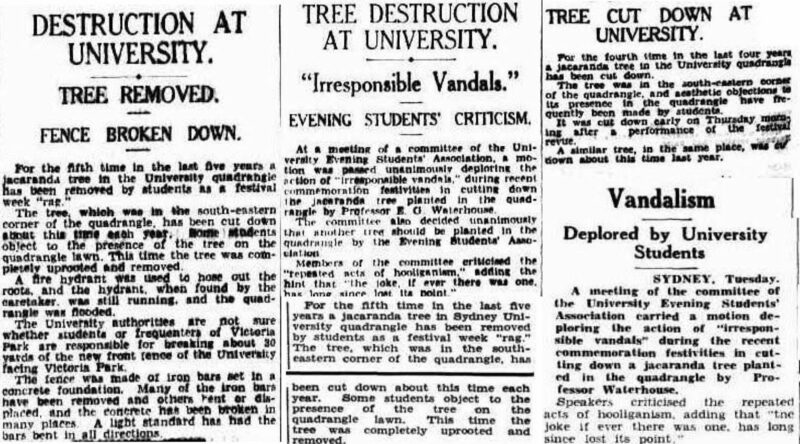 Waterhouse confronted the tree-saboteurs in the pages of Honi’s Letters to the Editor, naming the vandalism as ‘cowardly’, ‘contemptible’, ‘despicable’, ‘mean-spirited’, and ‘a blot on the scutcheon’. The students retorted that the real blot on the scutcheon was the tree itself. 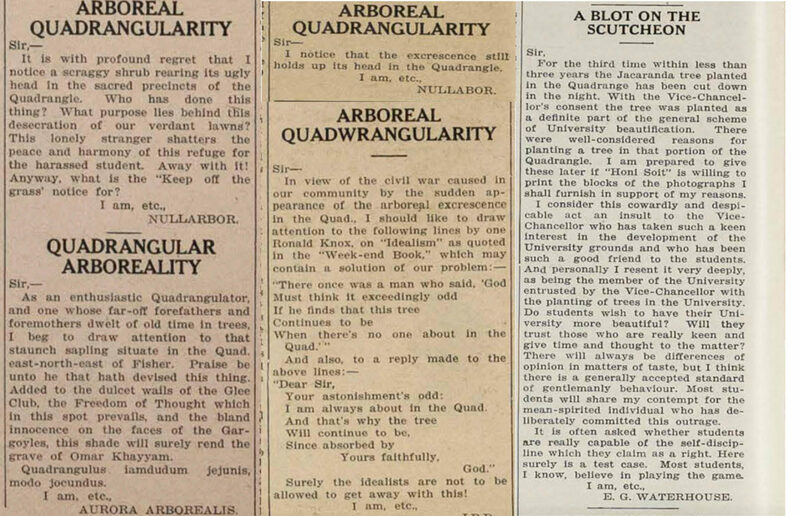 One of the vandals wrote back to Waterhouse under the pseudonym ‘Botanicus’ to complain of the ‘continuing offence’ of the existence of the jacaranda. Honi’s editors chose to disregard commands from the Council that anonymous anti-jacaranda agents be excluded from publication, citing their dedication to the ‘freedom of expression among the Student Body’. Between 1935 and 1939 the tree was assassinated five times in five years. Waterhouse called it ‘a dirty kind of work’, and rather plaintively enquired ‘Do students wish to have their University more beautiful?’, apparently uncomprehending of why the students might find the jacaranda’s beauty (or lack thereof) to be contentious. 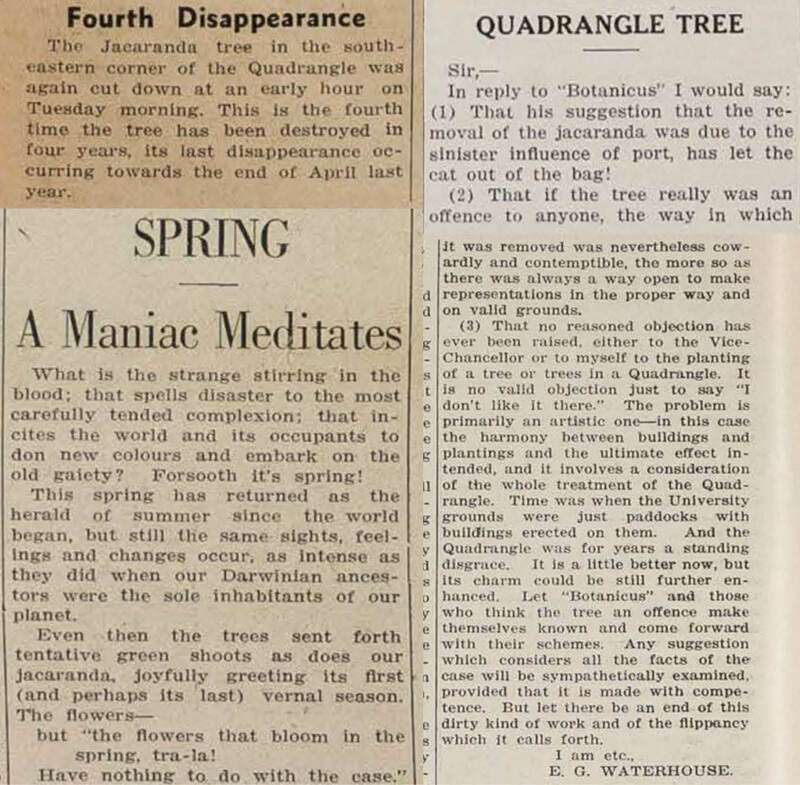 In their own way the students seemed to be rather fond of the tree, or at least of the gleeful scandal of its continuing destruction; in 1938 a student rather cheekily described the effects of the blush of spring on the University, including ‘our Jacaranda, joyfully greeting its first (and perhaps its last) vernal season’. Efforts to protect the tree from its academic enemies saw an iron and concrete fence being built around the thing, the Yeoman Bedell and the Students’ Evening Association keeping a night watch over the vulnerable sapling, and frequent patrols of the area to look out for unsavoury characters that might seek to harm the tree. None of these measures worked. In 1939, after several years of the tree being cut down every year around the University Commemoration festivities, 30 yards of the protective fence were broken down, with the iron bars being bent or removed and the concrete smashed. The jacaranda’s roots were exposed by way of being blasted with a fire hydrant, which was left running after the vandals absconded with the entirety of the tree, causing the Quadrangle to flood. 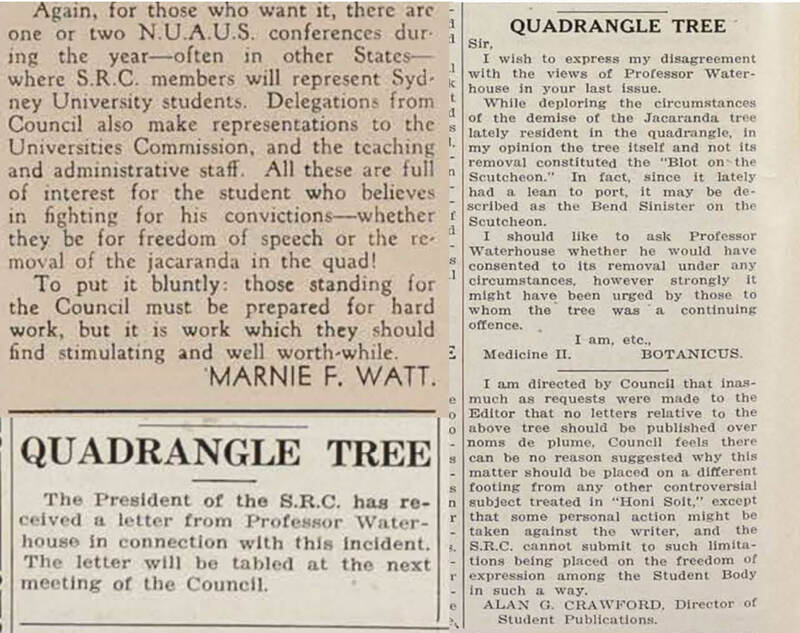 As late as 1945 Honi Soit made reference to ‘the student who believes in fighting for his convictions—whether they be for freedom of speech or the removal of the jacaranda in the quad!’ Judging from historical and aerial photographs contained in the University of Sydney Archives, the tree that lasted the longest was most likely planted sometime in the 1950s, along with three other jacarandas that did not survive. Photographs from the 1960s show a tree that begins to bear some resemblance to the ‘beloved’ jacaranda described in last year’s obituaries. According to Waterhouse his eventual triumph was achieved by way of growing a jacaranda secretly in a nursery and transplanting it to the University grounds once it was too large to easily uproot or damage. There is a jacaranda in the Vice-Chancellor’s garden that was probably planted sometime between 1926 and 1928, thereby outliving both the actual Quad jacaranda and the mythical one. The jacaranda that met its demise last year was probably between 55 and 75 years of age. The jacaranda planted this week, alongside a native Flame Tree, is the descendant of a proud tradition of 88 years of replacement jacarandas. Looking at it now it does seem to be more of a ‘scraggy shrub’ than the ‘lordly tree’ that Waterhouse so admired, but given time it may well flourish into a tree of equal import to its immediate predecessor. The flame tree is already very beautiful, and as an Australian native its continued survival seems surer than that of its South-American sibling.